The sixth edition of the annual study evaluating the development of the geothermal sector in Europe has been published by EGEC, the European Geothermal Energy Council. In conjunction with the release of the report, EGEC has also unveiled its new logo and website. The report shows that over the last five years (2012-2016), the use of geothermal energy, particularly for heat, has slowly but steadily increased across Europe. In Europe, there exist more than 100 geothermal power plants, with an installed capacity that amounted to around 2.5 GWe in 2016 (of which 1 GWe is in the EU), producing some 15 TWh of electrical power every year. It is believed that the installed capacity on the continent will grow to around 3 GWe in 2020, with this major increase linked to the rapid growth of the Turkish market. 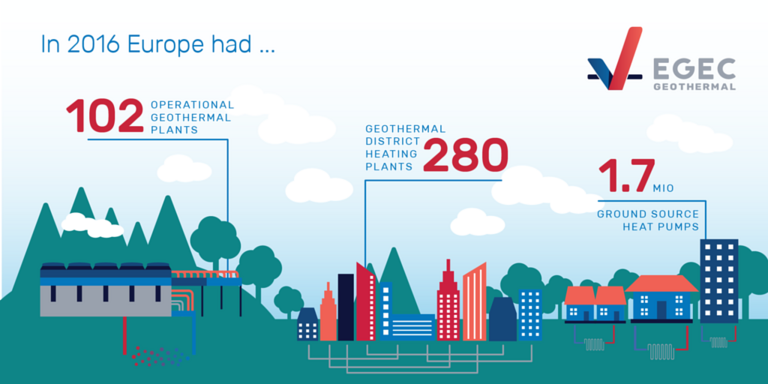 District heating and cooling is a success story for geothermal in Europe, and it looks set to see rapid and dynamic expansion in coming years. Between 2012 and 2016, 51 new plants have entered into operation (all in the EU), which represents an average annual growth of 10%. The total installed capacity in Europe is now approximately 4.9 GWth with the main markets for future years being France, Netherlands, Germany, and Hungary. The shallow geothermal market is the largest market by far. Yet the installation growth rate is declining; a capacity of more than 20 GWth was achieved at the end of 2015, distributed in over more than 1.7 million installations in Europe. “While geothermal energy is on its way to becoming a key player in Europe, there is a need for long-term financial and regulatory stability”, said EGEC President Ruggero Bertani. “The EU legislative proposals currently on the table in Brussels do not provide sufficiently strong incentives to increase the share of the most efficient renewable heating and cooling technologies and to develop the next generation of flexible renewable electricity,” he added. EGEC encourages the European Parliament and the Council to improve the Commission’s proposals and put the European Union back on track towards its commitment to becoming the world number one in renewable energy. Since its first edition in December 2011, the EGEC Geothermal Market Report has come to be seen as the authoritative overview of the entire geothermal sector in Europe. Every edition offers an in-depth review of different geothermal technologies: the focus of the 2016 edition will be the market as regards equipment and operation and maintenance costs. This year, for the first time, the report also includes a global market overview. The key findings can be downloaded at www.egec.org.